Reaffirming its commitment towards introducing new technology and fueling innovation in its Smartphone range, Panasonic India today launched the power packed Eluga A3 and A3 Pro and announced the appointment of Bollywood celebrity Taapsee Pannu as the new face for its Smartphone Business, in addition to Varun Dhawan, the existing brand ambassador. The company also unveiled its latest brand campaign– ‘So Much To Do’ for the new Eluga product series, allowing the user to do so much. Panasonic Eluga A3 and Eluga A3 Pro equipped with ARBO – the virtual assistant are priced at Rs. 11,290 and Rs. 12,790 respectively. 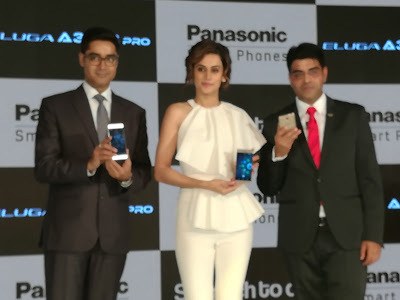 The smartphones were today launched in the capital in the presence of Mr. Manish Sharma, President & CEO, Panasonic India & South Asia, Vice President, Appliances Company and Executive Officer, Panasonic Corporation, Mr. Pankaj Rana, Business Head – Mobility Division, Panasonic India and actor Taapsee Pannu. The new range comes with Panasonic’s stylish innovative design and enhanced camera features, giving consumers the ultimate opportunity to experience and do much more. The full metal body smartphones with split-screen feature come with a massive 4000 mAh battery thereby giving it ample backup to last for a day. The 9.1 mm light weight devices come with an impressive 5.2” Full HD display with Asahi Dragon Trial glass and a thin bezel, giving the user enhanced visual experience with sharper image quality and vivid colours. The 13 MP Phase Detection Auto Focus rear camera with LED flash and 8 MP front camera captures life-like pictures and superb selfies. Conveying elegance and panache, the Eluga A3 and A3 Pro offer 16 GB and 32 GB internal storage respectively and support expandable storage up to 128GB via a microSD card slot. The devices are power-driven by 1.25 GHz, MTK 6737 Quad –core (Eluga A3) and 1.3GHz, MTK6753 Octa-core processor (Eluga A3 Pro). The 4G VoLTE enabled smartphones provide additional security to the user with the Front Fingerprint Sensor. Both the devices are paired with 3GB RAM, Android 7.0 Nougat and Google Duo for user friendly one-on-one video calling and for connecting faster with your loved ones. Eluga A3 and A3 Pro will be available from 10th August 2017 onwards across all Panasonic brand shops and other retail outlets across the country.